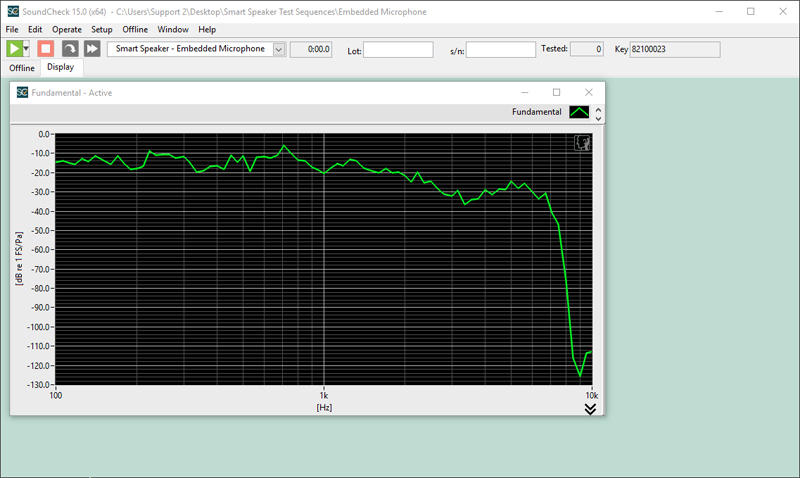 Smart Speaker – Embedded Microphone Test Sequence – Listen, Inc. This sequence demonstrates a method by which SoundCheck can measure the performance of a microphone embedded in a so-called “smart speaker”. This example assumes that the DUT is an Amazon Echo but it can be adapted for use with virtually any other type of smart speaker by substituting the Echo’s voice activation phrase WAV file (“Alexa”) with one specific to the desired make and model. The sequence begins by playing a voice activation phrase out of a source speaker, prompting the DUT to record both the voice command and the ensuing stepped sine sweep stimulus. A message step then prompts the operator to retrieve this recording from the DUT’s cloud storage system. This is accomplished by playing back the recording from the cloud and capturing it with a Triggered Record step in the SoundCheck test sequence. 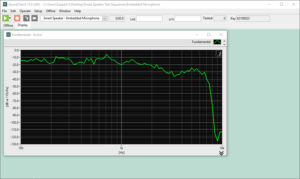 The Recorded Time Waveform is then windowed (to remove the voice command) and frequency shifted prior to analysis and the result (Frequency Response) is shown on the final display step.